Looking for a research career in environmental or occupational epidemiology? You’ve come to the right place. Rollins' MSPH dual degree program in environmental health and epidemiology provides a strong foundation in analytical epidemiology, biostatistics, and environmental and occupational health. The full-time program is designed to take two years to complete; part-time can take up to five years, depending on the number of credits taken each semester. Once you've finished your degree program, you'll be armed with a dual degree, practical experience in the field, and research experience. Learn principles of exposure assessment, environmental and occupational health policy, and toxicology. Conduct original, publishable research that applies analytic epidemiologic methods to an environmental/occupational health question. Graduates are well-positioned for environmental health positions as part of research teams in government, industry, or academia. 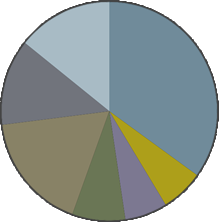 Click the pie chart to see careers of alumni, by sector. The full-time program is designed to take two years to complete; part-time can take up to five years, depending on the number of credits taken each semester. All environmental health applicants are required to complete both college-level biology and chemistry prior to matriculation. At least one semester of college-level biology and chemistry required. Successful applicants typically have GPA 3.5 or higher Your GRE scores are waived if you have a PhD from a U.S. institution. 48 credit hours: Includes 4 credits of a thesis, 14 credits core coursework, 31 required program credits, 3 or more electives. Students must also complete a 200-400 hour practicum and a thesis. The EH department offers several related courses and credits to help guide students through the culminating experience process, including EH 596-Research Design in Environmental Health and EH 599R- Thesis credits.